Another thing that adds to the interest factor for cars is if they’re unusually small (unusually big is cool too, but since the size of the average North American car is pretty big anyways, that becomes impractical pretty quickly), or if they’re in a rarely-seen utilitarian version. Think of station wagons, half-cars/utes, and panel vans based on wagons – what isn’t cool about those? 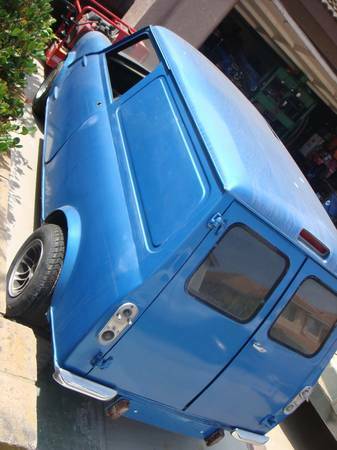 Okay, outward vision isn’t… anyhow, here’s a vehicle that covers a trifecta of cool-car criteria. 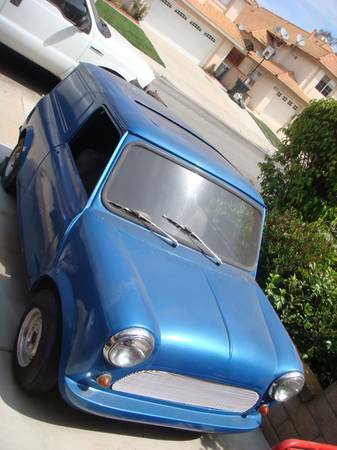 It’s unusually small, it’s a wagon-based panel van, and it’s fun around the corners – check out this 1961 Austin Mini van for sale for $2500 in Chino Hills, CA. Okay, it would be a lot cooler if it ran, but running driving examples are closer to $10K, and parts for these are commonly available and fairly cheap, so you’ll spend more through elbow grease than money or time spent searching for parts. The blue paint is of questionable taste, but this looks to have been a hot rod at some point, with smoothed-in grill, bumper delete, and some of the seams removed. It’s also got what seems to be a sliding sunroof, which must be a rarity in a work vehicle this old. The car is said to have good compression and be able to fire up, but can’t be driven due to its condition. No indication is given to the extent of the rust on this one, and it does look pretty clean from the outside. 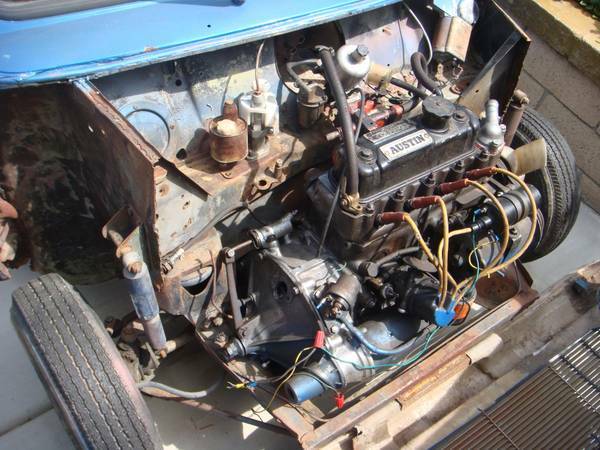 It’s said to be on a non-op registration, but the seller also says there is no title until it gets a CHP road test, so presumably the current seller has lost his copy of the title. As you can see, this one has received a nose job at some point, having the entire front cut off and replaced with a fiberglass forward-tilting unit. This should even further simplify servicing, but if the engine’s a runner it hopefully won’t need much until you get through the body. 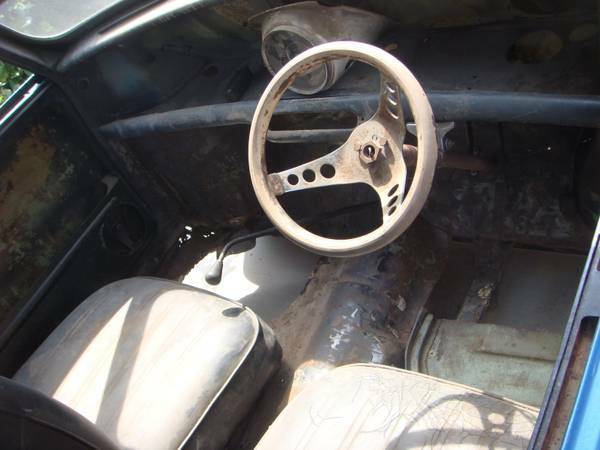 And the interior – missing seats, missing floorboards, and while you’re at it, why not replace that disco-awesome steering wheel? Or use that as the inspiration point for your project, and go full 1970s-vanning on the thing – shag carpet, pleated vinyl walls, maybe a mini-bar (no pun intended), and on the outside, an airbrushed mural and polished slotted mags? A 1275cc A-series would keep that moving along quickly once you’re ready for it, wouldn’t you say? This entry was posted on July 23, 2014 at 4:27 pm and is filed under Feature. You can follow any responses to this entry through the RSS 2.0 feed. You can leave a response, or trackback from your own site.